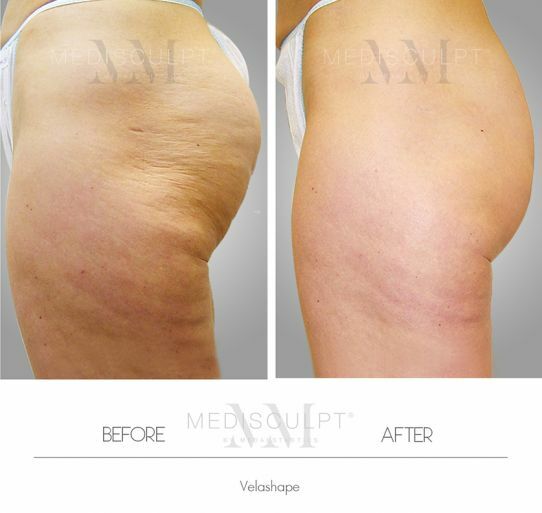 Introducing Perth’s first Velashape III™ for non-surgical cellulite reduction and body contouring. Medaesthetics™ are proud to introduce the latest generation of world renowned Velashape™ platform in Subiaco Clinic. Cellulite is a common skin skin condition affecting millions of Australians. Even though its not an illness or a medical condition as such, it has the potential to cause significant emotional stress and can affect self esteem and confidence of individuals suffering from it. Cellulite is the appearance of dimples on the skin due to the presence of small fibrous connective tissue bands that attach the underside of the skin to the deeper tissue facia. In some people with genetic predisposition, these fibrous bands are very strong and pull the skin downwards more noticeably, creating the superficial deformity of dimpling skin. Even skinny people are known to have cellulite. How can we fix cellulite? Once we understand what causes cellulite, its easier to see that in most people no amount of exercise or weight reduction will get rid of cellulite. Unfortunately, there are no miracle creams or lymphatic draining techniques to fix cellulite either. If anyone promises you miraculous results, then they are simply misleading you and interested only in your cash. Surgical disruption of fibrous bands using liposuction cannulas (with or without laser) and surgical cutting wires are the only known methods of breaking fibrous bands permanently. Due to the nature and extent of cellulite in most patients, it can become a very challenging task to surgically remove all the fibrous bands in any given area. The cost, potential risk and complications and time involved to do the job satisfactorily varies from person to person. Some of the bands can reattach after surgical disruption as well and have to be released again. This option works well for people with a few large dimples in the outer legs and buttocks area. Sometimes we have to fill the dimples with micro fat injections at the same time for optimum results. This option works well for people with a few large dimples in the outer legs and buttocks area. Being a non-surgical treatment, the results achieved by Velashape III™ are not permanent. They last for up to 8 – 12 months and repeat treatments are needed every 6 to 8 months to maintain the smooth look. Its just like having dermal fillers or Anti-wrinkle injections done on regular intervals to maintain the optimum results. The treatment is not painful at all. Some heat and pulling sensation is felt in the area being treated. Most patients describe it more like a “heated massage’ sensation. Velashape III™ treatment start from $250/area /session when 5 or more treatments sessions are purchased. Individual treatment are $300/area per session. Our Dermal Therapists would be able to give you an exact estimate of costings involved once we determine that you are the right candidate for this treatment.